The National Democratic Front of the Philippines-Bicol introduces its new spokesperson in the person of Ka (Comrade) Maria Roja Banua. Carrying on the late Ka Greg Bañares’ deferred task brought about by his martyrdom, Ka Roja continues NDFP-Bicol’s further mandate of broadcasting the revolutionary standpoint of Bicol region’s oppressed and exploited masses in their struggle for a genuinely free, just, and progressive society. Hold high the flag of the CPP on its 45th anniversary! This 26th December 2013, the Revolutionary Front for the Defense of People’s Rights-Brazil (FRDDP-Brazil) sends Red greetings to the Central Committee of Communist Party of Phlippines (CPP) for the celebration of 45 years of your organization. We warmly greet your leaders, cadres and other militants, as well as the masses run and organized by the Party fighting heroically for New Democracy Revolution and Communism. We greet the New People’s Army, commands and Red combatants, especially its glorious and unforgettable martyrs. We greet also the National Democratic Front, all masses and national minorities, mobilized and organized against imperialism and the local ruling classes. 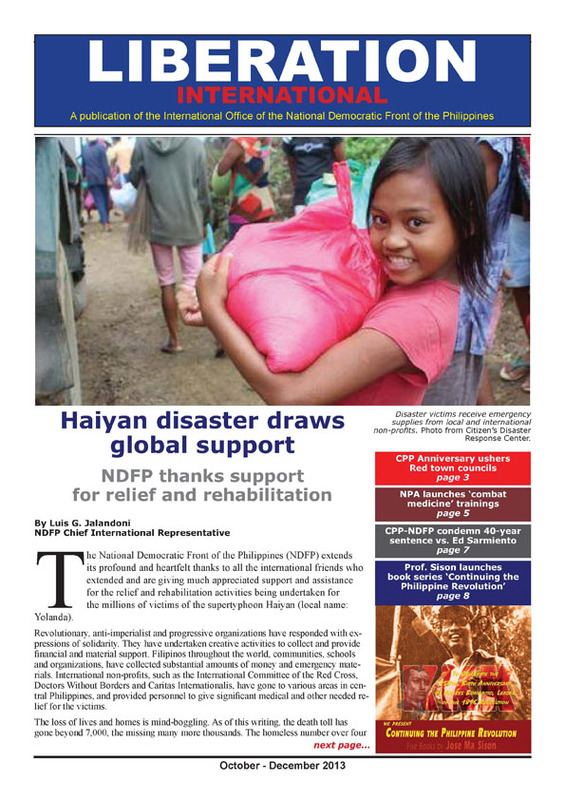 https://www.ndfp.org/sayt/wp-content/uploads/2014/01/frddp_brazil01.jpg 503 670 Roselle Valerio https://www.ndfp.org/sayt/wp-content/uploads/2018/11/ndfplogoonly-2-300x300.png Roselle Valerio2014-01-23 16:53:232014-01-23 16:53:23Hold high the flag of the CPP on its 45th anniversary!